In addition to the Release modes you can select from the Release mode dial on your Nikon D7100, you have access to a couple of other features that tweak the way the shutter is released — Exposure Delay mode and remote-control shooting. As an alternative to mirror lockup, you can use the Exposure Delay feature when you want to ensure that the movement of the mirror doesn’t cause enough vibration to blur the shot. Through this option, you can tell the camera to wait 1, 2, or 3 seconds after the mirror is raised to capture the image. Look for the setting in the Shooting/Display section of the Custom Setting menu. Just don’t forget you enabled the feature, or you’ll drive yourself batty trying to figure out why the camera isn’t responding to your shutter-button finger. 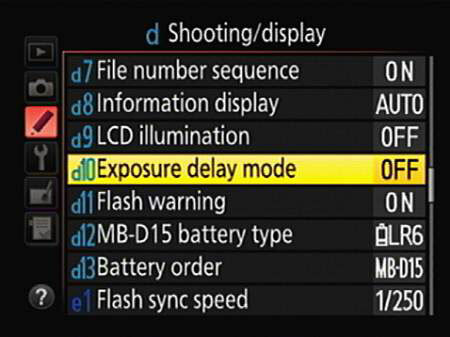 To help remind you, the Information display sports the letters DLY under the shutter speed value. Also, the Exposure Delay feature isn’t compatible with Continuous High or Continuous Low shooting — if you enable it in those modes, you get one image for each press of the shutter button rather than a burst of frames. Delayed Remote: The shutter is released 2 seconds after you press the button on the remote control unit. Quick-Response Remote: The shutter opens immediately after you press the button. Remote Mirror-Up: As its name implies, this setting enables you to use the remote for mirror-up shooting, a technique explained in the preceding section. Off (default): The camera doesn’t respond to the remote control unit.